In another first round match, students representing the University of Kent battle it out with the University of Newcastle for a place in the second round. Students representing the University of Nottingham compete with the University of Swansea in another first-round match. Jeremy Paxman asks the questions. The students from University College, London encounter the students representing the University of Exeter in another first round match. Jeremy Paxman asks the questions. In the penultimate first-round match of the student quiz, the University of St Andrews clashes with Worcester College, Oxford. Jeremy Paxman asks the questions. 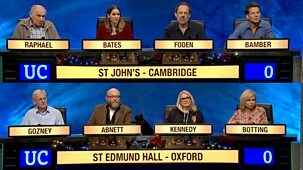 It is the second of the semi-finals in the University Challenge Christmas quiz for grown-ups.\n\nJeremy Paxman asks the questions. The quarter-finals continue when two teams of university students battle to reach the next stage in the competition. 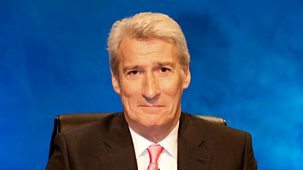 Jeremy Paxman asks the questions.